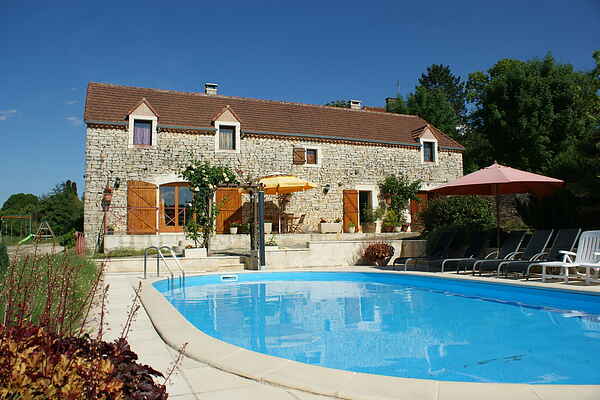 This vacation home with view of the forests and fields is located at 150 meters from Thédirac. In the well tended garden at the front of the house there is a terrace with outdoor furniture and umbrella. Have a dip in your own private pool complete with outdoor shower, or relax in the hot sun on one of the sunbeds. At the back of the house there is a second terrace with a summer kitchen and two barbeques (brick built-in and gas). A swing, tennis table and slide will make sure the children do not get bored! Inside the house the interior is open, light and very tastefully furnished with as a special attribute, a large \"vide\". Thédirac is located in a wooded area between Cahors (20 km) and the medieval Gourdon (25 km). In Gourdon there are houses and a church from the 13th - 16th century. The larger Cahors is well know for the Gothic drawbridge over the Lot (Pont Valentré) and of course also for its wine. A visit to the wine castles is also an excuse to taste the wine (and buy!). Also pay a visit to the Grottes du Pech Merle 944 km), the beautiful St. Cirq-Lapopie (50 km) and the Château de Cénevières (60 km). In the area of Catus (7 km) there is a lake with canoe and pedal boat rentals.